Be sure your loved ones are cared for. Everyone should have a will. It doesn't matter if you're 20, 30 or 90—you should have a will. It's as simple as that. You may be thinking, "I'm young, I'm in excellent health, I take care of my self—so why do I need a will?". You may have an accident, you may become the victim of a crime or you may become mentally incapacitated. Hopefully, none of these befalls you; however, you just don't know what the future could bring. If you think you don't have much property and you have nothing worthwhile to leave to someone—think again. Each of us has things worthy of distribution to someone—a bank account (it doesn't matter how small), an automobile, a stereo, a home computer, furniture, jewelry, paintings, china, etc. Even if everything were sold at an estate auction, it would probably yield several thousand dollars which could be useful to someone you care about, your favorite charity or your school. • The court appoints an administrator for you. • Your heirs will benefit equally—not necessarily in the proportions you would like. • Your estate may lose thousands of dollars in needless taxes. • You cannot provide for minors because the court will appoint a guardian for them; the guardian will make decisions about their care that you could have made. • You cannot support a charitable cause. • You cannot arrange for the care of your beloved pet. If you think that since you're married and all your property is in joint names and there is no need to have a will, you're wrong. Having property in joint name is not an excuse for not having a will. If both of you should die at the same time, there is no estate distribution plan and the state will decide. Or, the other spouse could predecease you. Having everything in joint name is also a bad estate plan because the first spouse to die loses the benefit of his or her lifetime estate tax exemption. Also, if you're married with children and think that your spouse will get everything anyway, you're wrong! If you die without a will, your children may share in a major part of the estate. Without a will you're leaving everything to chance and at the discretion of whatever state laws are in effect. Your spouse may not receive what you would want and your children could benefit disproportionately. • Your assets will go to those you care about most. • You can appoint an executor to oversee the distribution of your assets. • You avoid unnecessary expenses for the administration of the estate. • By naming a guardian or establishing a trust, you provide for minor children. • You provide for family members, friends or relatives according to your wishes and their needs. • You can save considerable estate tax. • You can support charitable causes that are special to you. • You can arrange for the care of your pet. How should you prepare your will? 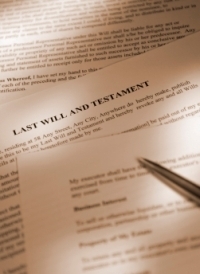 Now more than ever, it is quite easy to prepare a will. You can even do it online for a minimal price; however, depending on the size of your estate and the complexities of your wishes, it would be best if you consulted with an attorney who specializes in will preparation.